The Hagan Core Women’s boot is loaded with acronyms you don’t need to know. The important facts are: it’s simple, walks well, and skis well. 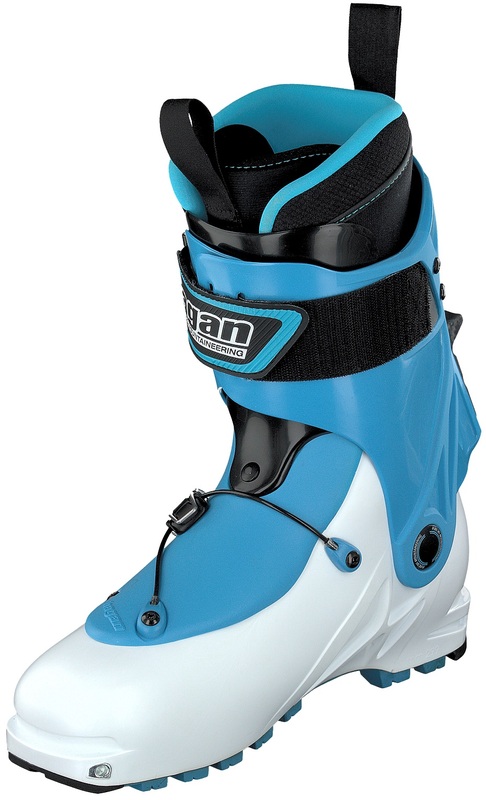 The lower buckle uses a smart wiring system that acts like a toe buckle and an ankle buckle, locking your foot in place to reduce blisters and improve ski performance. The upper buckle is a Velcro strap that can adjust the flex of the boot. Changing modes is a simple throw of a rear lever that is well protected from the elements. 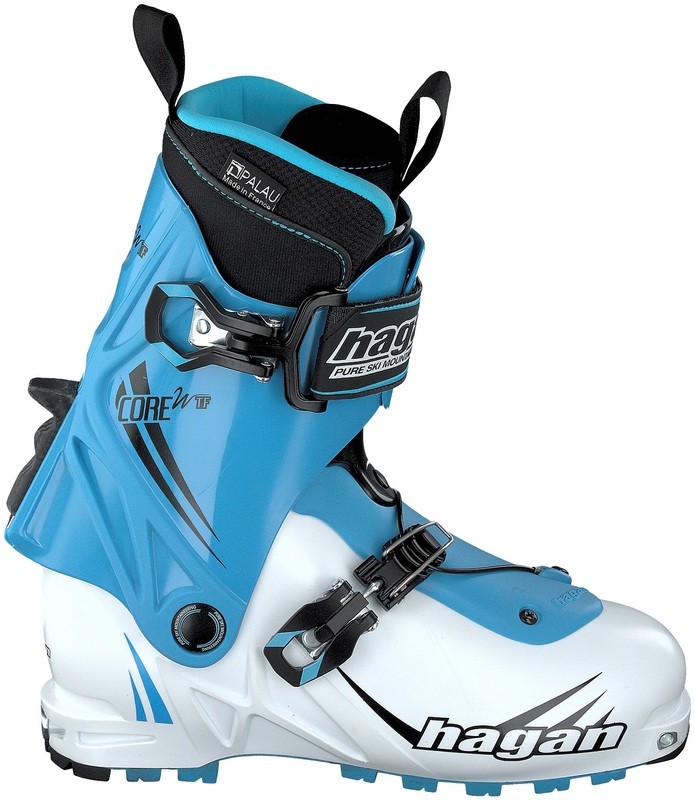 If you enjoy ski touring and not dealing with boots, check out the Hagan Core. If you want a simple backcountry touring boot that walks and skis well, check out the Hagan Core. Loaded with marketing acronyms (below), the Core boots aren’t loaded with complexity. A micro-adjustable lower buckle uses a wire to get the effect of multiple buckles locking your heel in place. An infinitely adjustable upper Velcro booster strap acts as the top buckle. A reliable ski/walk switch in the back changes modes. Put your feet in, walk uphill, transition, ski down, repeat. The Hagan Core boots have that procedure mastered. MDB – Multi-Deflect Buckle system secures forefoot and ankle with a single closure. OCB – Oversized Closing Belt is a Velrco buckle / booster combo that levers easily. ESL – Easy Slide Lock ski/walk mode switch slides as easily as it’s named. AGS – Anatomically Guided Shell is a highly researched shell shape to just fit. NFT – Neo Flex Tongue is dual density to bend on the uphill and stiffen the down. BFC – BaX Frame Cuff is a molded X frame that stiffens the highest pressure vectors. MGS – M-Grip Soles are a special rubber compound molded into H shapes for grip. 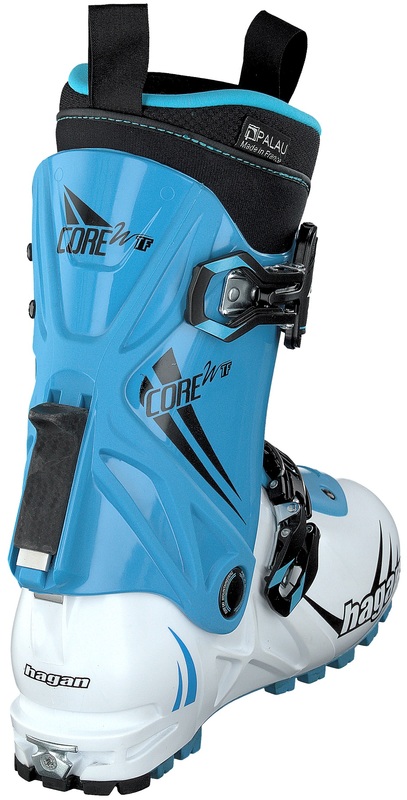 SRH – Standard Rear Heel works with tech fittings, frame bindings, and the Kingpin. CTF – Custom ThermoFormable liner is Ultralon foam (ala Intuition). OCD – Probably describes you if you managed to read all these TLAs. Notes Oversized Velcro buckle closes the boot at the desired stiffness. Bottom Line Ideal companion for long days.